To put it simply, a monetary union among independent states cannot be built on the illusion that there are no sovereign risk differences. But it cannot be stable and well- functioning without credible institutions and policies to anchor risk differentials to fundamentals, letting country risk systematically magnify shocks and cause divergence of borrowing costs of government firms and households across borders. Country risk polarisation has weighed heavily on the euro area’s recovery from the crisis. First, it has reduced the effectiveness of monetary policy. Policy rate cuts and other measures by the ECB could not be fully transmitted to (and thus reduce) borrowing rates in high-risk countries – rates remained volatile per effect of country risk. This consequence of polarisation has constantly fed disagreement among member state on the appropriate monetary stance at the union level. Second, risk polarisation has reduced the scope for fiscal policy. On the one hand, governments in crisis countries faced the need to adopt pro-cyclical austerity measures in the middle of a downturn and maintain a contractionary stance throughout the recovery (if any). On the other hand, governments in low-risk countries had an incentive to keep the budget relatively tight in order to maintain their low-risk status (and with this, very low borrowing costs). As a result, the aggregate macroeconomic stance of the euro area has remained insufficient, and the area has experience a slow recovery on average, even though some individual countries performed quite well by international standards. For the euro area as a whole, debt is not much higher than for other large industrial countries and/or macro regions in the world. However, as a result of risk polarisation, the debt distribution in the region is heavily asymmetric. Today, the burden of debt is higher where employment and economic activity are still far from satisfactory (or even below pre-crisis levels) and fiscal and financial risks are still high. In the absence of effective corrective measures at both the national and euro area level, debt overhang is likely to cause the existing differences to persist for a long time into the future. In crisis countries, high sovereign debt and risk foreshadow higher taxes and lower provision of public goods. This in turn discourages domestic investment and economic activity, exacerbating inequality (e.g. Brinca et al. 2017) and even fostering the migration of (skilled) labour (e.g. Bandeira et al. 2017). Debt overhang thus weighs heavily on the success of budget correction policies and reforms (Müller et al. 2016). In this chapter I will first discuss the work of ADEMU on the roots of the country risk crisis in the EU, and then delve into three issues relating to strengthening the euro area’s ability to address the problem. The first is the need for a monetary backstop, largely satisfied by the launch of the Outright Monetary Transactions programme by the ECB in 2012. The second is the still largely open question of how to stabilise large recessionary shocks, if and when they occur in the future. The third is the rationale and scope for relying on an official lending institution to enhance debt sustainability in Europe, as a way to support debt deleveraging in the continent. The traditional theory of optimal currency areas has long called attention to the fact that joining a monetary union requires independent countries to give up autonomous monetary instruments of stabilisation and a key margin of adjustment, namely, the exchange rate. This loss may be more or less costly depending on key conditions concerning the scope and effectiveness of fiscal policy, capital market development, factor mobility, wage and price flexibility, and the symmetry of business cycle shocks. The influence of this theory on the policy debate cannot be emphasised enough (see the modern reconsideration by Chari et al. 2016 and Corsetti et al. 2016a). However, it is fair to say that this theory falls short of providing effective guidance for understanding the depth and nature of the country risk crisis in the euro area. Especially when the shocks bring the policy rate to its effective (zero) lower bound, large adverse shocks may activate amplification mechanisms and perverse spirals. Pioneering work by Rendahl (2016), Den Haan et al. (2017) and Ravn and Sterk (2016) stresses that, in response to a hike in unemployment, households tend to raise their saving rates substantially for precautionary purposes. When unemployment is high, it takes longer to find a job, which in turn magnifies income uncertainty for both workers who have lost their job and for workers who may fear losing theirs. As a result, aggregate demand falls, leading to more unemployment, more income uncertainty, and thus more saving. This negative spiral – unemployment, income uncertainty, low demand – has arguably affected all industrialised countries during the Great Recession, whereas monetary authorities could not reduce policy rates below their effective lower bound, and the scope for fiscal policy was constrained by debt accumulation. In the euro area, things were much worse. The negative spiral from labour income uncertainty interacted with another powerful negative spiral rooted in the strict interconnection of sovereign, banking and macroeconomic risk at the national level. This problem was documented and stressed early on by Corsetti et al. (2013, 2014) as well as by the Euronomics group – the latter with a focus on the ‘diabolic loop’ linking sovereign risk to credit crunches via the large exposure of national banks to domestic debt (e.g. Bocola 2016, Sosa-Padilla 2017). In the euro area crisis countries, there is a strong correlation between sovereign risk spreads, banking spreads, and the borrowing costs of households and non-financial firms (possibly well beyond what can be explained by inefficiencies due to a high concentration of national public debt in the balance sheet of national banks), as documented by Arellano et al. (2017) and Delatte et al. (2016), among others. It is worth restating, if only briefly, the main mechanism at play. In the two-year period between 2010 and the summer of 2012, markets started to price sovereign risk on expectations that some member states could run into difficulties in sustaining the large fiscal costs of their banking crises and/or their large debt or in rolling over their maturing liabilities, or in anticipation of a possible break-up of the euro (Kriwoluzki et al. 2017). At the time, especially after the statement by Merkel and Sarkozy in Dauville, there was virtually no policy framework that could anchor these market expectations. The moment markets developed arbitrary negative expectations of output growth in a country, they anticipated larger deficits and debt accumulation. A weaker fiscal outlook immediately translated into a hike of sovereign risk. With risk spilling over to all residents in the country (via a deterioration of bank assets and an anticipation of lower profits by firms), other things equal, interest rates rose on both government and private borrowing, driving down demand already in the short run. Unless policy measures, at the national or monetary union-wide level, could effectively counteract these effects, pessimistic expectations became self-fulfilling. Countries with high debt and limited fiscal space were extremely vulnerable to losses of market confidence. A discussion of the potential destabilising effects from these spirals is missing in the traditional optimal currency area (OCA) theory, as is a detailed analysis of what instruments a country would give up by delegating monetary policy to a common central bank. Work in ADEMU has explored the theoretical foundations of this key institutional development. Belief-driven runs on public debt have long been debated in the literature, in formal models at least since Calvo (1988). An analytical reconsideration of the mechanism is offered by Ayres et al. (2016), Bassetto and Galli (2017 ) and Corsetti and Dedola (2016). The role of the central bank in shielding a country from belief- driven runs is the main subject of the latter contribution, who considers the theoretical mechanism (and conditions) under which a programme of contingent debt purchases by the central bank can eliminate a government’s (welfare) incentive to default. An issue specific to monetary union is that individual member countries may not internalise the cost of union-wide inflation resulting from their default decision (in the extreme case in which balance sheet losses are so large that the ECB has to deviate from its target of making good on its liabilities) and/or may play strategically, counting on a monetary bailout ex post. To address moral hazard issues, OMTs are only activated if the country is in a European Stability Mechanism programme, and thus subject to conditionality and in receipt of official lending. The Outright Monetary Transactions programme launched by the ECB in 2012 has arguably eliminated, or at least reduced, the possibility of self-fulfilling creditor runs on a euro area member state. Yet, as discussed by Corsetti et al. (2017), the programme falls short of creating the conditions necessary for an accommodative fiscal policy stance, especially in response to large negative shocks. The reason is that in order to qualify for the OMT, a country’s fiscal policy must be pre-approved by policymakers from the other member states; this pre-approval is almost certain to require that the country’s fiscal policy be non-accommodative. In practice, national fiscal policies appear to have remained effectively non-accommodative after the start of the OMT programme, and thus close to the policies that presumably would have been required to obtain approval for activating government bond purchases by the ECB under the programme. An important step forward in completing monetary union consists of addressing fiscal pro-cyclicality. The first lesson from the crisis is that a large recessionary shock cannot be dealt with by relying exclusively on monetary policy, but rather accommodative monetary and fiscal policy together are required to satisfactorily stabilise the economy. A second key lessons from the crisis, specific to the euro area, is that the appropriate fiscal stance cannot be achieved without addressing polarisation, as this translates into either contractionary, or at best mildly expansionary, budget policies across the union. How can a monetary union among independent fiscal states achieve an accommodative aggregate fiscal stance in response to large recessionary shocks? There is no single institutional solution. Possible strategies are discussed in the ECB Working paper listed under Corsetti et al. (2016) and Tabellini (2016).1 An answer is also provided by the overarching proposal of a European Stability Fund for the EMU, discussed by Marimon in Chapter 2 of this eBook. Whatever the approach, it is doubtful that the euro area can afford to ignore the need to strengthen its stabilisation policy framework against the tail risk of large recessions. Debt overhang and country risk polarisation loom over the future of the EMU, motivating calls for ‘risk reduction’ and ‘risk sharing’. A fundamental challenge to completing monetary union consists of understanding how to optimally trade off these objectives – that is, have countries pursue fast deleveraging while reducing exposure to financial and macroeconomic instability (e.g. Tabellini 2017). This trade-off is complex and requires a careful reconsideration of both theoretical results and empirical evidence. In this respect, ADEMU has engaged in a thorough analysis of recent experiences of euro area and international institutions providing loans to crisis countries, through the lens of a quantitative model (Corsetti et al. 2017). Official loans affect governments’ incentives to issue, repay, or default on debt, hence they impact how much debt a country can sustain, just like tax capacity. In other words, official lending regimes can raise the amount of debt that is sustainable at any point in time vis-à-vis both fundamental and rollover risk. Euro area lending institutions can, in principle, support countries in their efforts to reduce outstanding liabilities and address debt overhang, by basically shielding these countries (and the union) from the costs inherent in a default. A quantitative exercise can shed light on the most efficient ways to achieve this goal, and highlight policy trade-offs to be taken into considerations. By comparing the ESM and the IMF programmes in the euro area, it is apparent that the ESM lends more, at much longer maturities and at much lower rates (Gabriele et al. 2017). Focusing on Portugal as a case study, Corsetti et al. (2017) develop a quantitative model contrasting the effects of long-term and short-term official loans, offered at different below-market rates, on a government’s optimal decision to default in economies subject to both fundamental (output) and rollover risk. Results from the exercise show that official loans can substantially raise debt sustainability. In the counterfactuals, Portugal can sustain up to between 80% and 180% of GDP depending on parameter specifications. Lengthening maturities has a stronger impact than reducing official lending rates. However, the analysis also shows that, by making a higher stock of debt ‘safe’, official lending affects the average debt level that the government optimally maintains in the long run. A higher average debt ends up making the country more vulnerable to adverse dynamic developments in (exogenous) fundamentals. In other words, official lending causes fundamental default to become more likely. It is worth stressing that the trade-off described above exists independently of the effect that lending may have on a government’s incentives to exert ‘effort’ or implement ‘costly reforms’ to enhance sustainability (these are not modelled in the exercise). These results suggest that, while the ESM and IMF have undoubtedly contributed to containing potentially disruptive effects from the country risk crisis, their activities need to be framed in a more general and consistent strategy of risk reduction and risk sharing. Looking at recent policy proposals, it is not uncommon to treat the euro area›s debt problem as two separate problems: first, how to restructure the large stock of legacy debt; second, how to create new institutions that will allow improved international risk sharing in future. This approach raises deep theoretical issues. Time-inconsistency is central to both problems: Brendon (2018), a significant debt write-down may be desirable now, but would violate past promises. A credible risk-sharing institutional design must be robust to future reassessment. The key question challenging economic theory is to how to consider both components simultaneously – that is, how to find a normative approach to international risk sharing that will prescribe an appropriate level of outstanding debt and its future evolution, given a country›s recent economic and fiscal performance. ADEMU provides leading work in this direction, with theoretical contributions (e.g. Brendon and Ellison 2017, Kehoe and Pastorino 2016 and Balke and Ravn 2016), but especially with the proposal for a European Stability Fund detailed by Ábrahám et al. (2018). Ábrahám, A, E Carceles-Poveda, Y Liu and R Marimon (2018), “On the optimal design of a Financial Stability Fund”, ADEMU Working Paper 2018/105. Arellano, C, Y Bai and L Bocola (2017), “Sovereign Default Risk and Firm Heterogeneity”, NBER Working Paper No. 23314. Ayres, J, G Navarro, J Nicolini and P Teles (2016), “Sovereign Default: The Role of Expectations”, ADEMU Working Paper: 2016/025. Balke, N and M O Ravn (2016), “Time-consistent fiscal policy in a debt crisis”, ADEMU Working Paper No. 2016/049. Bandeira, G, J Caballe and E Vella (2017), “Should I Stay or Should I Go? Austerity, Unemployment and Migration”, ADEMU Working Paper No. 2017/083. Bassetto, M and C Galli (2017), “Is Inflation Default? The Role of Information in Debt Crises”, ADEMU Working Paper No. 2017/059. Brendon, C, and M Ellison (2017), “Time-Consistently Undominated Policies”, ADEMU Working Paper No. 2017/082. Brendon, C (2018), “International risk sharing and sovereign debt restructuring”, mimeo, Cambridge University. Brinca, P, MH Ferreira, F Franco, HA Holter and L Malafry (2017), “Fiscal Consolidation Programs and Income Inequality”, ADEMU Working Paper No. 2017/078. Chari, V V, A Dovis and P Kehoe (2016), “Rethinking optimal currency areas”, ADEMU Working Paper No. 2016/009. Corsetti, G and L. Dedola (2016), “The Mystery of the Printing Press: Monetary Policy and Self-fulfilling Debt Crises”, ADEMU Working Paper No. 2016/035. Corsetti, G, K Kuester, A Meier and G Müller (2013), “Sovereign Risk, Fiscal Policy, and Macroeconomic Stability”, Economic Journal 123(566): F99-F132. Corsetti, G, K Kuester, A Meier and G Müller (2014), “Sovereign risk and belief-driven fluctuations in the euro area”, Journal of Monetary Economics 61: 53-73. Corsetti, G, K Kuester and G Müller (2016a), “The Case for Flexible Exchange Rates in a Great Recession”, ADEMU Working Paper No. 2016/024. Corsetti, G, L Dedola, M Jarociński, B Maćkowiak and S Schmidt (2016), “Macroeconomic stabilization, monetary-fiscal interactions, and Europe’s monetary union”, ADEMU Working Paper No. 2016/058. Corsetti, G, A Erce and T Uy (2017), “Official Sector Lending Strategies During the Euro Area Crisis”, ADEMU Working Paper No. 2017/070. Delatte, A, J Fouquau and R Portes (2016), “Regime-Dependent Sovereign Risk Pricing during the Euro Crisis”, ADEMU Working Paper No. 2016/032. Den Haan, W, P Rendahl and M Riegler (2016), “Unemployment (fears) and deflationary spirals”, ADEMU Working Paper No. 2016/008. Gabriele, C, A Erce, M Athanasopoulou and J Rojas (2017), “Debt stocks meet gross financing needs: a flow perspective into sustainability”, ADEMU Working Paper No. 2017/067. Kehoe, P and E Pastorino (2016), “Fiscal Unions Redux”, ADEMU Working Paper No. 2016/012. Kriwoluzky, A, G Müller and M Wolf (2016), “Exit expectations and debt crises in currency unions?”, ADEMU Working Paper No. 2016/005. Müller, A, K Storesletten and F. Zilibotti (2016), “Sovereign Debt and Structural Reforms”, ADEMU Working Paper No. 2016/056. Ravn, M and V Sterk (2016), “Job uncertainty and deep recessions”, ADEMU Working Paper No. 2016/030. Rendahl, P (2016), “Fiscal policy in an unemployment crisis”, Review of Economic Studies 83(3): 1189-1224. Sosa-Padilla, C (2017), “Sovereign Defaults and Banking Crises”, ADEMU Working Paper No. 2017/076. Tabellini, G (2016), “Building common fiscal policy in the Eurozone”, VoxEU.org, 24 April. 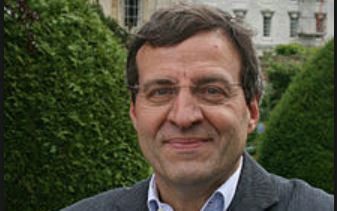 Giancarlo Corsetti is Professor of Macroeconomics and director of Cambridge INET at the University of Cambridge. His main fields of interest are international economics and open-economy macro. His main contributions to the literature include models of the international transmission mechanisms and optimal monetary policy in open economies; theoretical and empirical studies of currency and financial crises and their international contagion; models of international policy cooperation and international financial architecture; quantitative and empirical analyses of the multiplier and fiscal policy. His work is published in leading international journals including American Economic Review, Brookings Papers on Economic Activity, Economic Policy, Journal of Monetary Economics, Quarterly Journal of Economics, Review of Economic Studies, and the Journal of International Economics (where he has long served as co-editor). Corsetti is a Research Fellow of CEPR. He is a research consultant to the Bank for International Settlement, European Central Bank and the Bank of England. This entry was posted in News on June 18, 2018 by ADEMU.